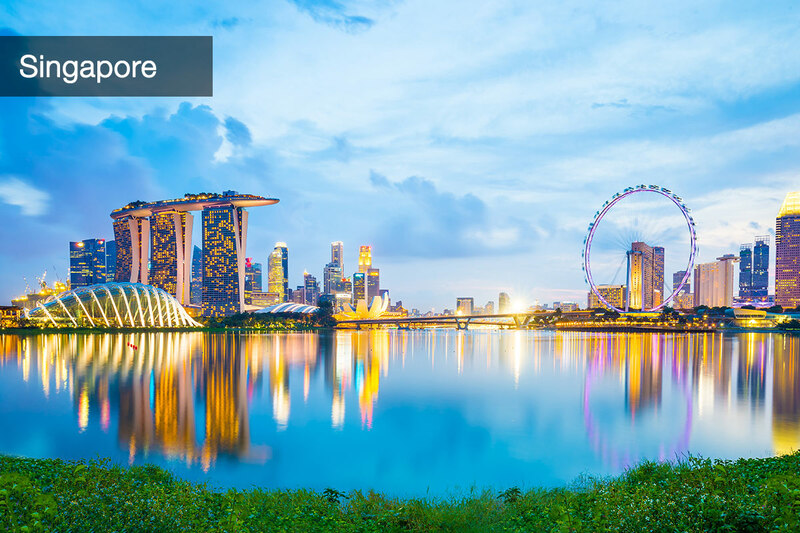 Including return Singapore Airlines or Cathay Pacific flights, choice of end-of-tour stopover in either Singapore or Hong Kong staying in 4 and 5 star accommodation, delicious daily breakfast, in-depth sightseeing, and more. 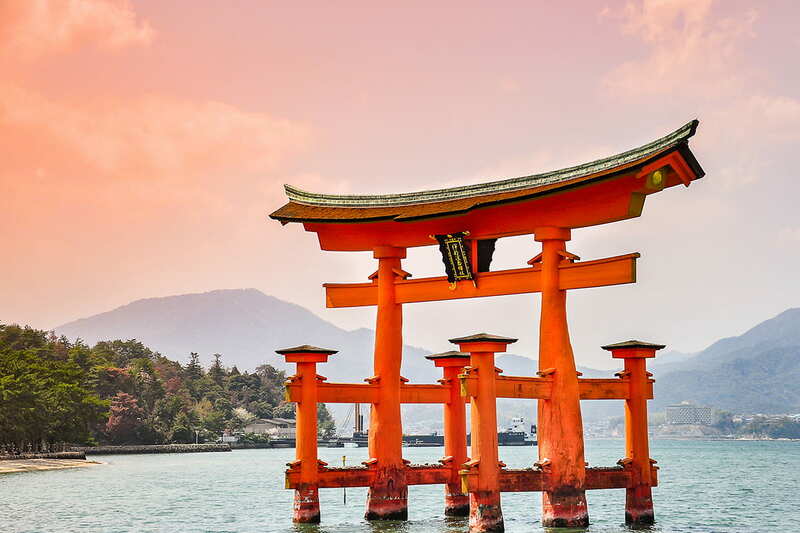 Unearth the history and charms of Japan on a 11 day Japan Golden Route tour, which also includes a 3 night stopover in either Singapore or Hong Kong. 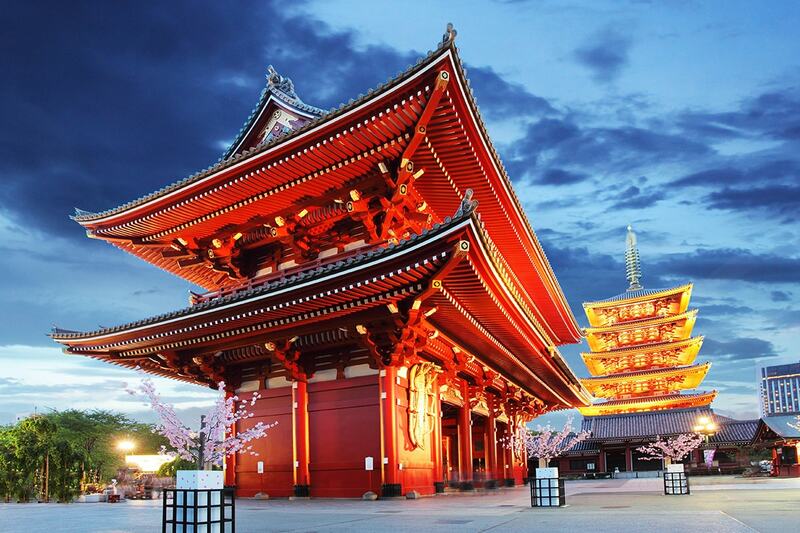 The journey begins in Osaka and your time in this vibrant city includes a visit to Todaiji Temple, one of the most recognisable temples in Japan. Look up in awe at the imposing bronze statue that calls the temple home and have a wildlife encounter as you walk back through Nara Park and get up close to some of the park’s wild (yet friendly) deer. Continue to Kyoto and take in views of the city from Kiyomizu-dera Temple. The insight into Kyoto’s history doesn’t stop as you also see Nijo Castle and Togetsu-kyo Bridge. 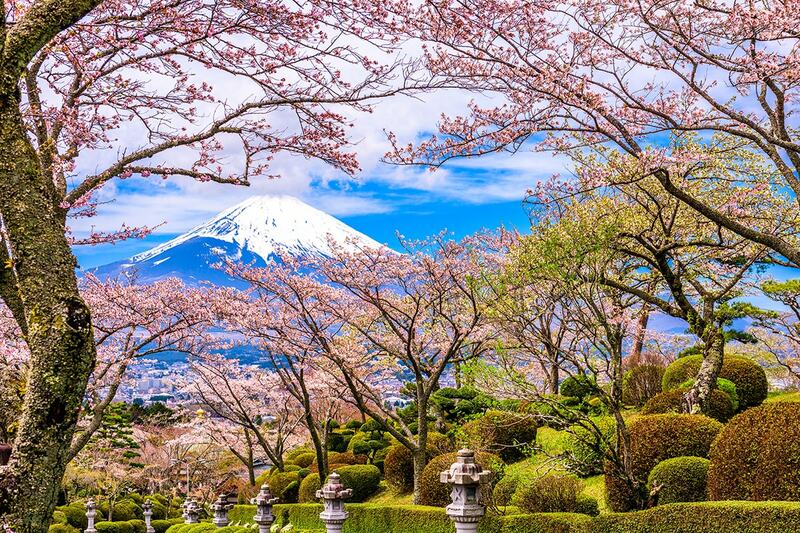 Board a bullet train for the heart-racing journey to Shizuoka, and swap Japan’s brightest cities for some of its most beautiful countryside vistas as you admire the area around Mount Fuji. 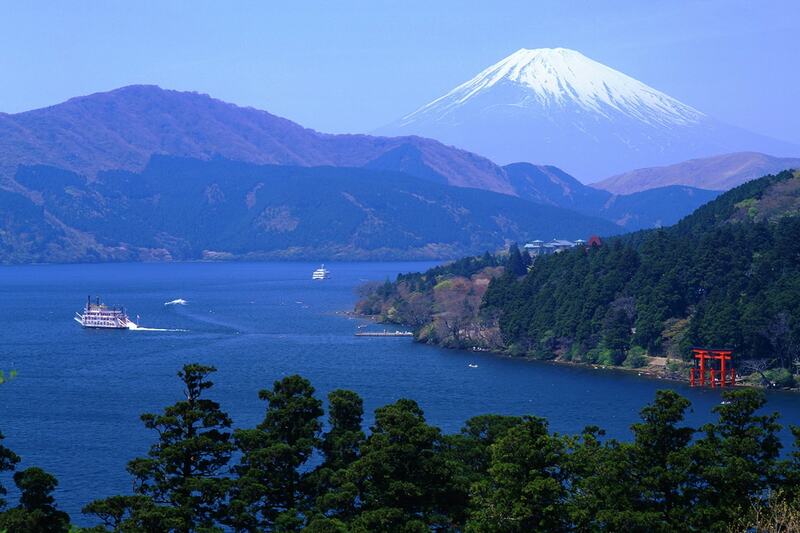 The views from Oishi Park and Mount Fuji 5th Station are particularly breathtaking. 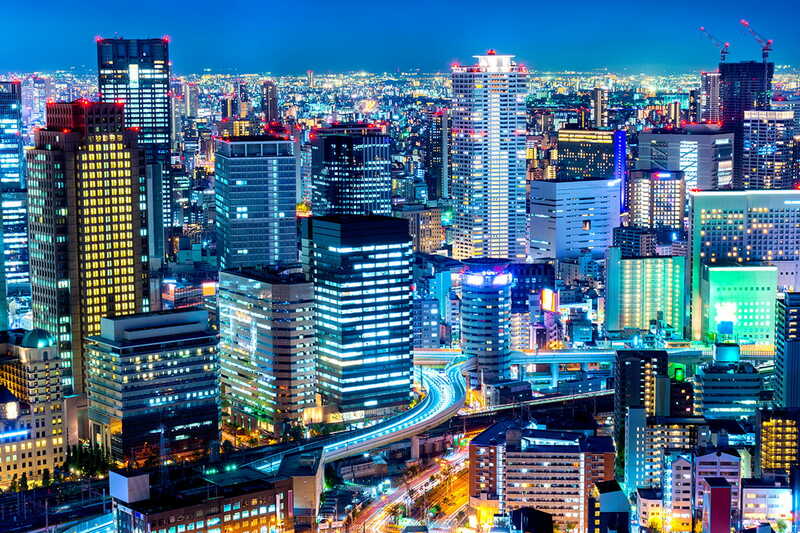 Travel to Tokyo, one of the world’s most energetic and neon-lit capitals. Your holiday doesn’t end as soon as you leave Japan; conclude your trip on a high end with a city break in your choice of Singapore or Hong Kong. 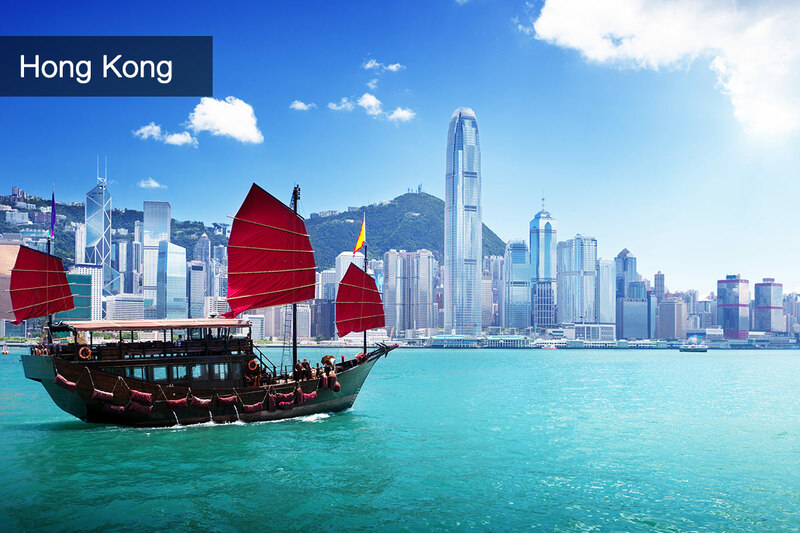 Explore the waterfront attractions and high-end shops of Singapore or indulge your palate for delectable hawker markets and street eats in frenetic Hong Kong. No matter which city you choose, expect accommodation in 4- or 5-star hotels, full buffet breakfasts and airport transfers. Arrive at Kansai International Airport (KIX) and meet a tour representative at the arrival lobby exit gate inside the airport. A transfer takes you to the hotel. 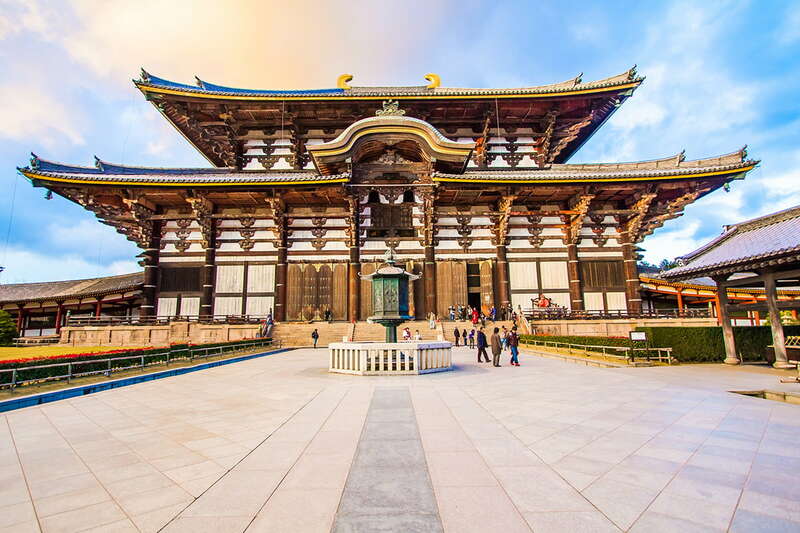 Drive to Nara and visit Todaiji Temple. This huge temple is one of the most famous in Japan and it houses a behemoth, 15-metre-tall bronze statue of Buddha. Take note of the Nio guardians that stand by the entry gate to the temple. 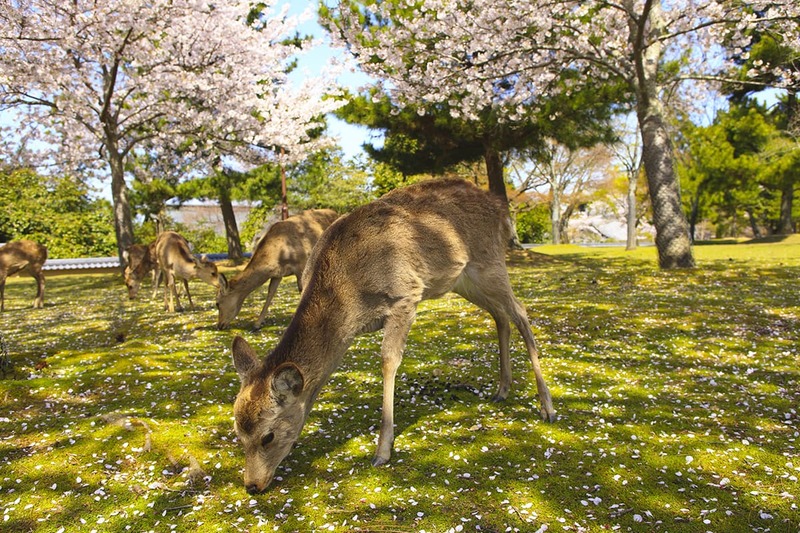 Wander through Nara Park on the way back from the temple and have an up-close encounter with some of the park’s 1200 free-roaming deer. 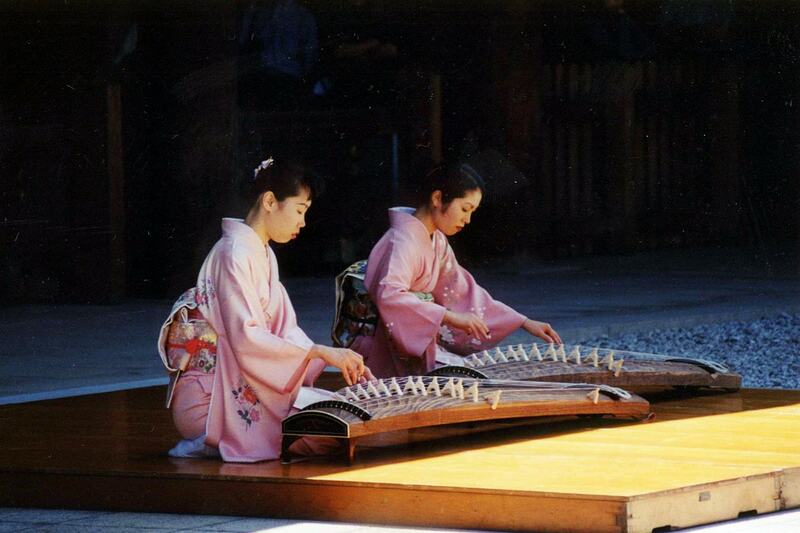 The tour continues to Kyoto where the first stop is the UNESCO World Heritage Site-listed Kiyomizu-dera Temple. Hold a cup beneath one of the three water streams at Otowa Waterfall and drink to your future prosperity; each stream represents a different fortune. Venture to Nijo Castle. This UNESCO World Heritage Site was the Kyoto residence of the Tokugawa Shogunate, which was the last feudal Japanese military government. 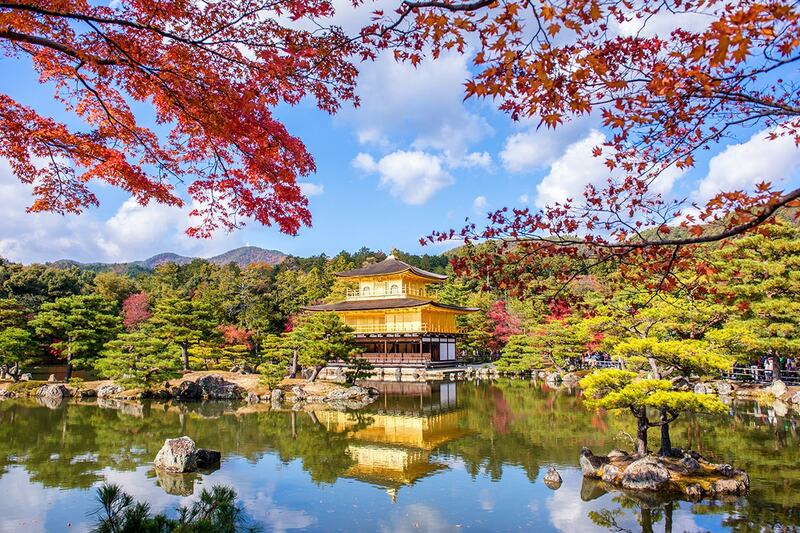 The next stop on today’s itinerary is Kinkakuji, also known as the Golden Pavilion. 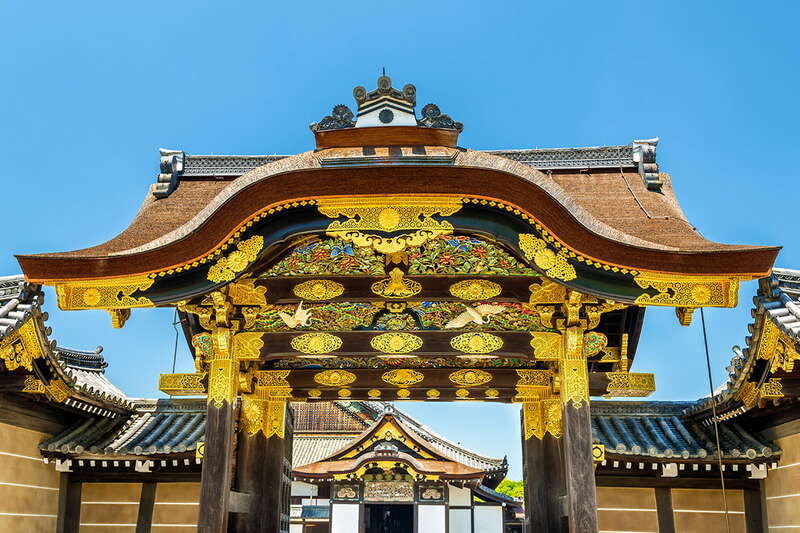 Two floors of this temple are covered in layers of thin gold and incorporate three distinct styles of architecture. Your time in Kyoto finishes with a visit to Togetsu-kyo Bridge, and the group then moves to the station to board the Shinkansen bullet train to Shizuoka. A transfer takes you to the hotel upon arrival in Hamamatsu. The group makes its way towards the Mount Fuji area to Lake Ashi. The image of the lake with Mount Fuji as its background is one of the most photographed scenes in Japan. Visit Oishi Park to capture your own scenes of the mountain and then continue up to Mount Fuji 5th Station. Thanks to its perch at 2300 metres above sea level, the station gives it visitors incredible panoramas of the Fuji Five Lakes Area below. Head to Tokyo in the afternoon. Today we drive to Hama-Rikyu, a beautiful landscape garden in central Tokyo featuring seawater ponds, which change level with the tides, and a teahouse on an island where visitors can rest and enjoy the scenery. Then we relax on a Sumida River cruise. Later, stroll through the Asakusa Kannon Temple one of Tokyo’s most colourful and popular temples before browsing for souvenirs at Nakamise Shopping Street. Your last stop today is Shinjuku Municipal Observation Building for panoramic views of Tokyo before heading to your hotel. Depending on your selected stopover destination, you will be transferred to the airport for your flight to either Hong Kong or Singapore. On arrival in your selected city, you will be transferred to your hotel. Today is yours to explore your selected stopover city at your own pace. Today at the appropriate time, you will be transferred to the airport for your homeward flight. Please note that some flights may depart and arrive home the same date, which is day 10 of the itinerary. 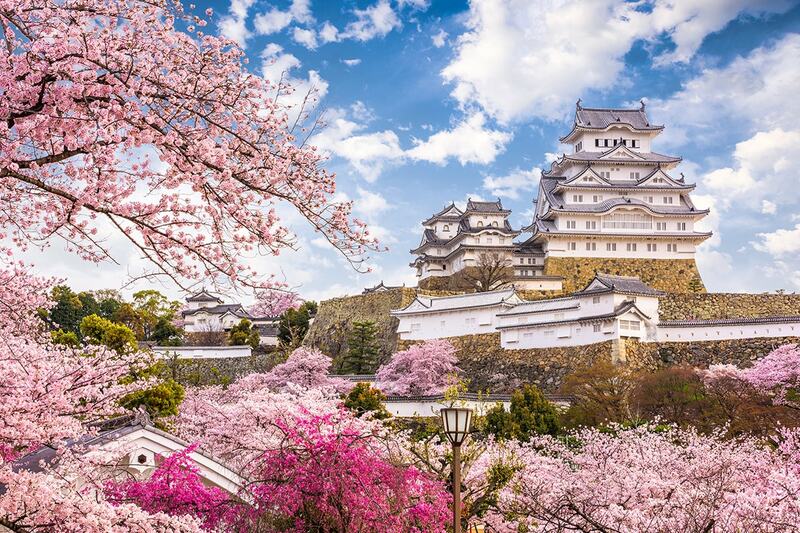 Board an overnight flight to Osaka and get ready to begin your tour of Japan’s Golden Route. 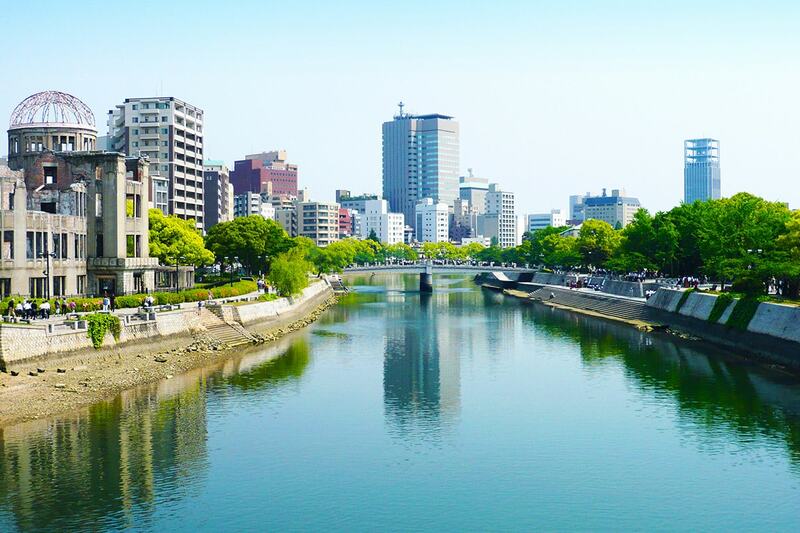 After breakfast, we make the trip to the moving city of Hiroshima. Largely destroyed when the first atomic bomb was dropped over Hiroshima on August 6, 1945, the city became known worldwide for this unenviable distinction. Enroute, we stop in Himeji to visit the castle. The castle is regarded as the finest surviving example of prototypical Japanese castle architecture, comprising a network of 83 buildings with advanced defensive systems from the feudal period. It was registered in 1993 as one of the first UNESCO World Heritage Sites in the country. After, continue on to Hiroshima. 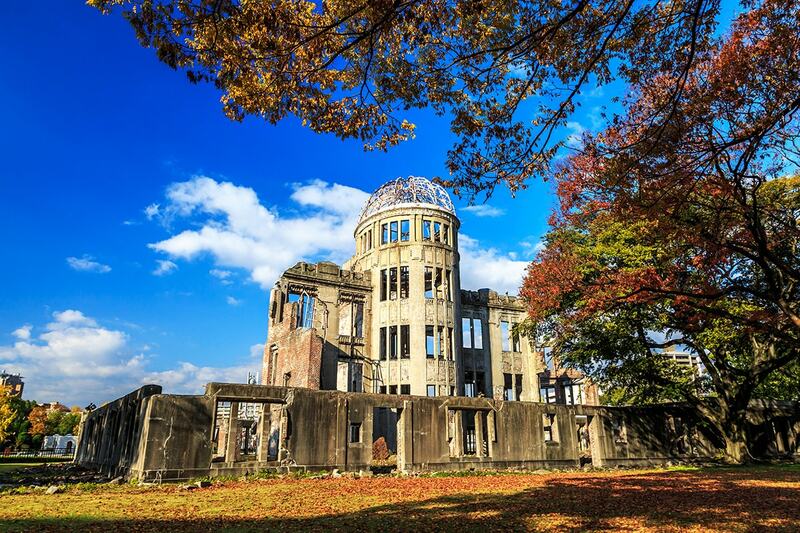 The day begins by visiting the Hiroshima Peace Memorial Museum, which commemorates the victims of the bomb drop. This is followed by a trip to see the Itsukushima Shrine on Miyajima, where you can see the Great Torii Gate on the water at high tide. Head back to Osaka in the afternoon. 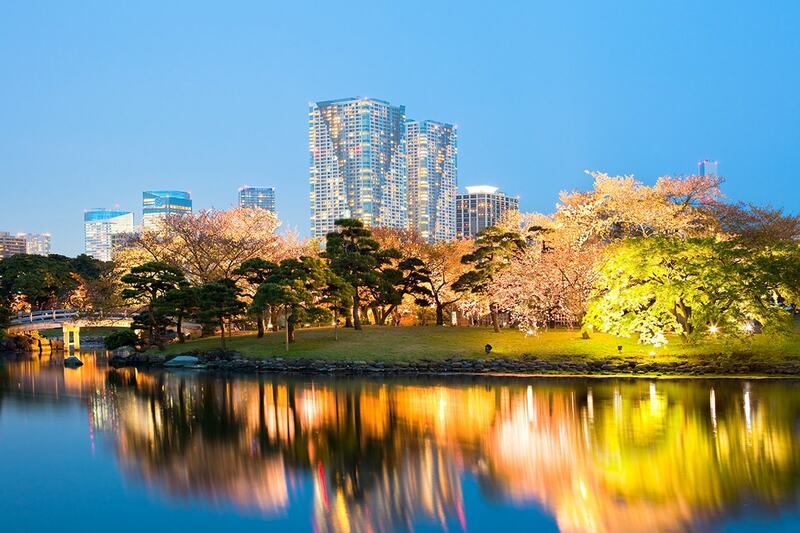 You are taken to Hama-rikyu, a serene landscaped garden located in the centre of Tokyo. The garden features a teahouse as well as seawater ponds with water levels that change with the tides. Relax on a cruise on the Sumida River and later stroll through Asakusa Kannon Temple. There is time to shop for souvenirs and mementoes at Nakamise Shopping Street. The day’s last stop is Shinjuku Municipal Observation Building to take in the exceptional views across Tokyo’s cityscape. Bid goodbye to Japan today and board a flight to your chosen stopover destination, either sleek Singapore or the hectic Hong Kong. On arrival in your selected city, you will be transferred to your hotel. Start your morning by making the most of the full buffet breakfast and then spend the day at your leisure. A transfer will take you to the airport at the appropriate time, ready for you to board the flight back home. Please note that some flights may depart and arrive home the same date, which is day 12 of the itinerary. 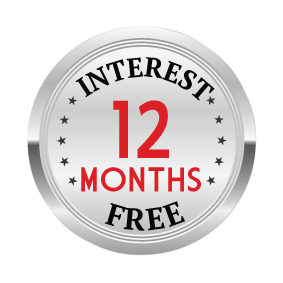 A deposit of $1,275/$1,325 per person are due at the time of purchase in order to secure your date. 11 Day – $1,400 per person in addition to the twin share voucher. 13 Day – $1,600 per person in addition to the twin share voucher. Payable direct to our Travel partner upon confirming your dates. * Peak Season Dates – $350 surcharge per person applies on these dates. Please refer to the calendar. * Peak Season Dates – $400 surcharge per person applies on these dates. Please refer to the calendar. Adelaide or Perth Customers – A $300 Interstate surcharges applies per person. Some flights may depart or arrive a day before/after, involve up to 2 transits, stopover or a substitute airline. These changes are beyond our control and will be confirmed upon booking.